Today I’m delighted to share the work of The Tiny Marmalade who make beautiful marmalades in tiny jars and who also specialise in Marmalade Wedding Favours. The Tiny Marmalade is based on countryside goodness and every home-made preserve comes straight from the heart of Devon, being both Fairtrade and original. I’m Paloma, a Spanish mum living in Devon who has changed the Madrid skyline for the countryside life style. I work full time and I have 2 children of 2 and 4 years old. I love to play basketball, discovering new places and new food and reading. I am the owner of The Tiny Marmalade Company. I have always had a weird obsession for tiny things. Tiny things are cute and lovely. You can hold them in your hand, collect them or carry them in your pocket. I love small cards, glittery stickers, all sort of minuscule boxes, puppies, kittens, doll house furniture, fairies, tangerines, cupcakes, rings, ladybird and babies. Everything is better in miniature format. This is how the tiny marmalades arrived in my life. I have more than 100 different tiny jars at home. Some years ago I found myself unable to find another new jar for my tiny collection, so I decided to start preserving and packing them by myself. The Tiny Marmalade was born officially in October 2013. The beauty of small things: a ladybird in a green leave, warm sunshine in my kitchen table, chocolate kiss from my kids, a good book, a nice landscape, a long walk. Do trends influence the products you stock/ service your provide? Each harvest is unique. Weather and temperature can change, just like our cooking mood. All our ingredients are delicately selected from the highest quality range. Fruits, herbs, leaves, peels, sugar and scents are softly preserved and carefully packed in lovely tiny jars. This procedure makes each one of our marmalades a limited edition that will probably not be repeated. Each recipe is made following traditional open pan methods. We try to promote the art of eating. As consumers we don’t really know from where the product we are buying come from, how has been produced, etc. We try to show that eating fresh, quality, fairtrade, sustainable, original and exclusive products don´t need to be a difficult or expensive. We are members of Love the Flavour and encourage people to buy local products. Receiving costumers compliments is the best thing any producer can ever achieve. Every time somebody tells me that has enjoyed with any of my jams I get so excited that I almost cry of happiness. To be honest, setting up The Tiny Marmalade has been great fun so far. So I really would like to keep on enjoying it, making things because I love to and not because I have to. What can you do for Weddings? 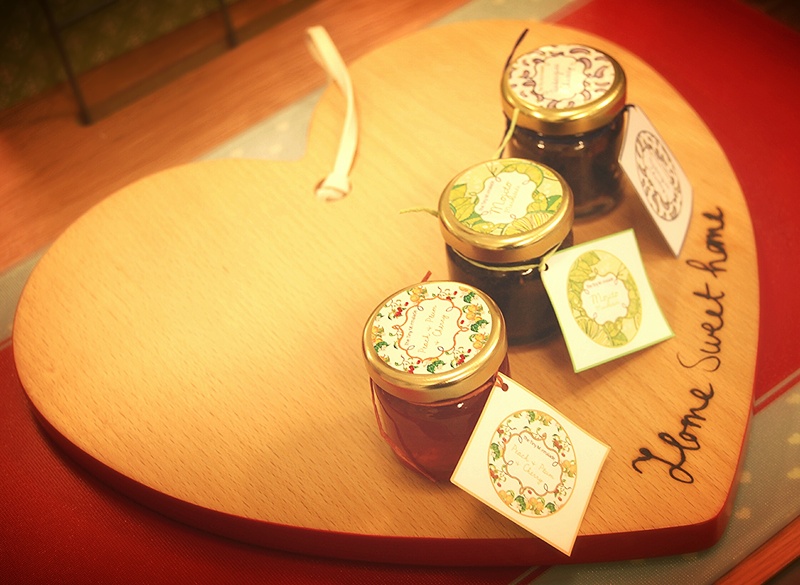 We can create the most perfect marmalade wedding favours to capture the spirit and theme of your wedding. At The Tiny Marmalade we know that your wedding is going to be one of the most memorable and best days in your life, if not the best. 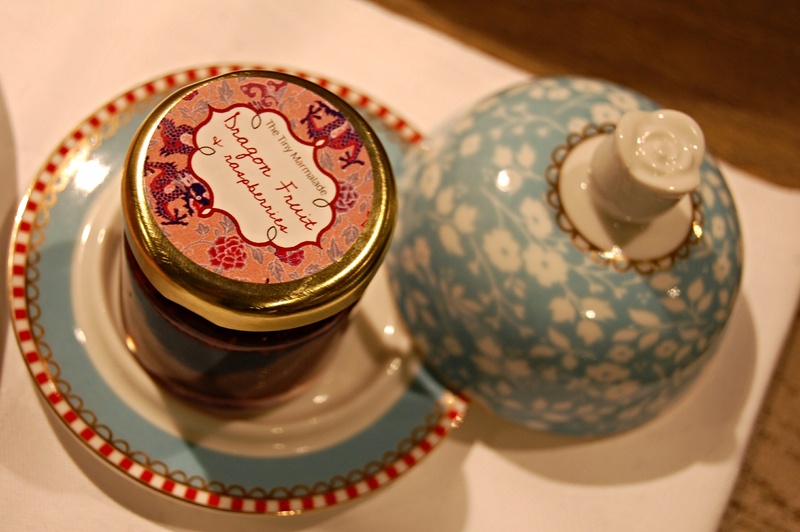 Our organic, fair-trade and original marmalades and jams are lovingly preserved in tiny and adorable jars. You choose your jam flavour and label colour, write a message or upload a photo, and make your wedding one to remember forever. 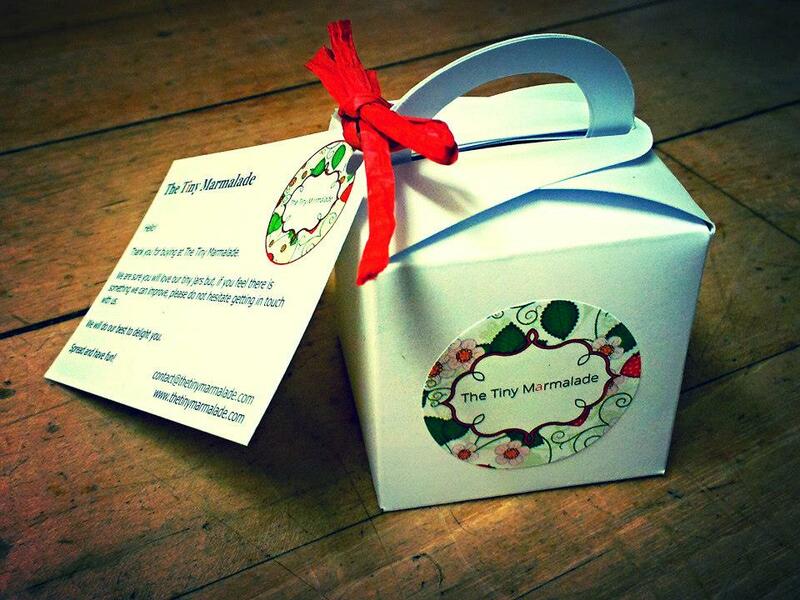 If you like, we can provide small and beautiful boxes in a wide range of colours and shapes. We are committed to people and the environment. This is why all our ingredients come from sustainable, respectful, Fairtrade and responsible sources. Our sugar is always Fairtrade. Always. The cane sugar we use is also organic. We only use seasonal fruit and vegetables helping the environment to be balanced. We produce each of our marmalades following traditional procedures. Grandma’s recipes are the essence of our being. We invest in our community buying from local producers, farmers and shops. Our jars are also purchased from small Devon retailers. We minimize our packaging to help reduce our carbon footprint as far as possible. All our boxes and paper are recycled or come from FSC certified companies. Everything at The Tiny Marmalade Co. is made with love and care. Thanks so much to Paloma for sharing her lovely wee cottage industry and her marmalade wedding favours. What a beautiful little gift to recieve, and enjoy. Its true that lovely things come in small packages. What a wonderful Christmas present! Being in your lovely blog is a complete pleasure! Thank you!!! !